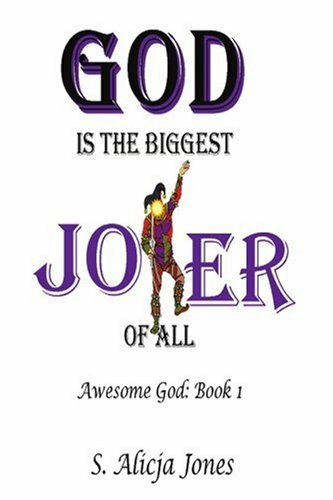 This book chronicles 20 years of the author’s journey from an ego based life to a spirit based life. It offers a single meditation for each day, one or two pages long, and a question and comment for reflection. It will help you eliminate those stumbling blocks that keep you from achieving your goals, dreams, and desires. 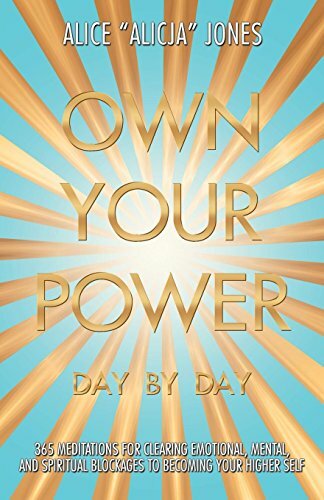 “"Own Your Power: Day by Day" by Alice ("Alicja") Jones is a gentle yet uplifting set of 365 essays, no more than 2-3 pages each. It is a book that I've come to treasure, and have just sent copies to my nieces and my god-daughter as Christmas presents. While this book contains many references to spiritual teachings found in both the Bible and in the well-known "A Course in Miracles," it is more personal and comforting. It contains spiritual truths and insights, many of which learned over the course of years of seeking, study, and honest inquiry - as well as Guidance from the Holy Spirit. I treat "Own Your Power" as a sort of spiritual companion to another well-known book, Sarah Ban Breathnach's "Simple Abundance: A Daybook of Comfort and Joy." Both have simple, encouraging, and supportive daily essays. Both reflect the author's own journey - and sometimes their respective trials and pitfalls in coming to new levels of awareness and realizations. Both are very helpful as part of a daily practice. When I give this book as a gift, as I've done with my nieces and my god-daughter this year, I like to give the hard-copy. That makes it likely to last for years, and it would be a good book in which someone can inscribe marginal notes, year after year. Because it fits so easily into a yearly reading pattern, these little notes would be a good way in which to connect with how we've felt in previous years. Alice Jones also mentions things that might seem a bit obscure or unusual at first, but which (over time) would be immensely practical and insightful. I feel that "Own Your Power" would also be a very good "heirloom book" - one that can be passed from mother to daughter over time, and be a great way in which to share a woman's spiritual journey and tradition of reflection. To all my friends who travel, whether on extended trips or on daily commutes, I'm recommending that they download this on their Kindle or e-reader. Whether someone reads a essay each day, while commuting to work, or absorbs a larger "chunk" of essays (perhaps while on longer travels), this book is refreshing, grounding, and very gently thought-provoking. It provides an excellent antidote and balance to the hectic nature of travel. “Own You Power is such a valuable and comprehensive book. Truly a Must read wherever you are on your spiritual journey. Alice discusses numerous concepts that I come upon from many speakers of this time. Her accounts are so clear and often tied to her personal experience, making them crystal clear and offering depth of understanding. "Know your power to heal: words can destroy you or heal you-act like a balm, a solvent, a solution to a problem. What to do? What to do? Air your grievances and allow the other person to air his or hers. Just as you want to be listened to, listen to the other. Honor their perspective. Their perspective comes from their perception. All perception comes from the ego. The ego is insane, Therefore, all perception will be distorted. Everything is seen through the filter of your experience. Learn to replace perception with knowing. Knowing comes from the Truth. Knowing comes from the Divine, from Spirit. Knowing is part of the Oneness of Me, of Who I Am, of Who You Are. You are One with Me, One with the Father. We are One, One Being, One Substance, One Light. You are the Light of the World Just as you cannot separate the different particles of Light from the whole, we cannot separate you from the whole. We see you as One. The kingdom of God is within you. I AM within you. You are within Me. There is nothing else. You only understand the connection to Me by going within. You reach Me from within. There is nothing outside of you but what you put there. You look outside of yourself for validation of everything. You won't find it there. It doesn't exist outside of self. It exists within."